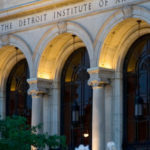 The Detroit Free Press has a story about the appraisal of the Detroit Institute of Arts holdings that raises some chilling and provocative thoughts. Few museums have the historical anomaly that makes the DIA a role in Detroit’s bankruptcy. But the danger of the appraisal now taking place—Christie’s will start with 300 works on view and then move to storage to value works thought to be worth more than $50k and finally on to the rest of what is estimated to be 3,500 works—is that it will reveal a much greater value than the $2.5bn bandied about recently.